Are you over 50 and looking for style inspiration? I just finished reading Style Forever, a highly appealing style guide for grown up women by That’s Not My Age blogger Alyson Walsh. I say “highly appealing” because not only is Style Forever well-written and chocked full of helpful style tips, the ideas are conveyed with a healthy dose of humor in the form of personal anecdotes, inspiring quotes, interviews with clever women over 50, quick-to-digest lists, and lots of lovely whimsical illustrations. Truly, this is a book with something for every woman over 50 or as Alyson calls us, Generation FAB (Fifty And Beyond). In her introduction, Alyson touches upon her inspiration for writing this book. She tells us about her experience in the world of fashion. For seven years, she was the fashion editor at Good Housekeeping—“hardly the temple of fashion, I know." She started a style blog while teaching at a university. Style Forever, she says, is a continuation of the conversation about grown up style that began with That’s Not My Age. “I strongly believe you don’t have to have youth to have style,” she writes. “That isn’t about age, it’s about mindset." Interspersed with the chapters and lists are interviews with style-conscious FAB women or “Style Heroines.” Some of these style mavens are well-known fashion icons, like Iris Apfel, while others might be better known to New Yorkers (Linda Rodin) or Londoners (Thelma Speirs) or Californians (Teruko Burrell). These accomplished women share their views on everything from style (“I never understand when people say they can’t find anything suitable for their age,” say Wendy Dagworthy, former designer and one of the founders of London Fashion Week. “Why do they have to have something different? I dress like my students.”) to what they would say to their 15-year-old selves (“…Be as nice as you can be,” says Cindy Joseph, former make-up artist and founder of the cosmetic line BOOM. “Love yourself. You are worth falling in love with.”). I am in awe of this book. Writing about style is a bit like walking a tightrope. Anyone who enjoys observing the way women dress is bound to notice fashions that tend to be flattering as well as fashions that, well, tend to have the opposite effect. Style observers who like to write are often compelled to share their observations, hoping to help women make sense of style. The trouble is it’s hard to write about fashion and style without it sounding like a bunch of fashion dos and don’ts. And style declarations (one of my all-time favorites: "Woman over 50 should never show their arms") are doomed right out of the gate. Why? Because there's such enormous variety of female shapes, attitudes and lifestyles. 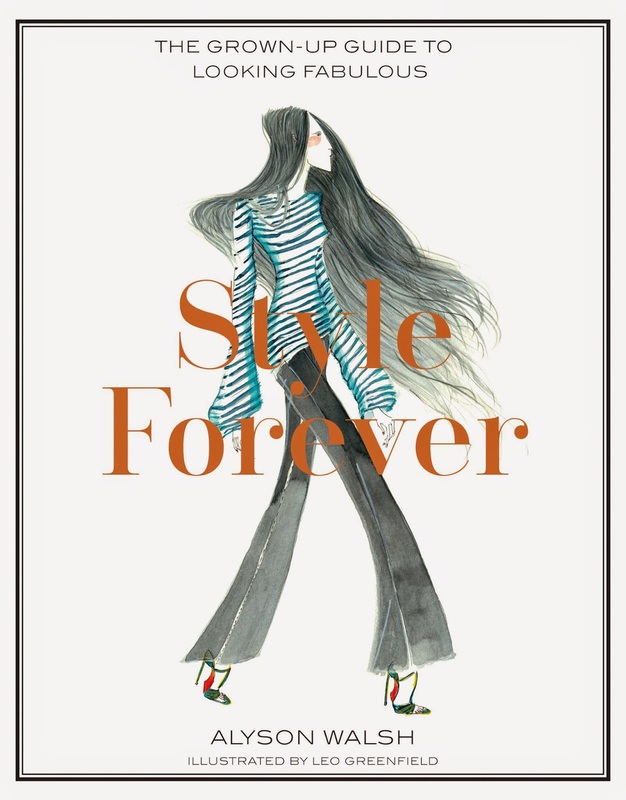 **Style Forever by Alyson Walsh and illustrated by Leo Greenfield (Hardie Grant, $19.95) will be available in the United States on September 1, 2015. It's currently available in the United Kingdom (Hardie Grant, £12.99).